Overlooking scenic fields, Maravilla Gardens is a beautiful and peaceful natural setting for weddings and special events. We know you have your own personal vision for your wedding day. Maravilla Gardens starts with your dream and elevates it beyond what you have imagined. Just north of Los Angeles, our simply sophisticated grounds offer lush lawns, fragrant specialty flowers, stunning views, gentle coastal breezes, and radiant sunsets. 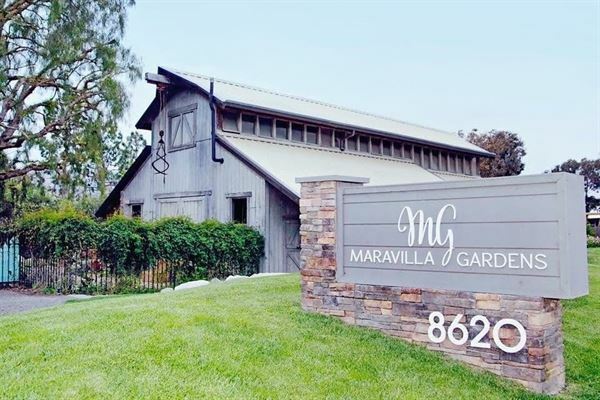 Allow us to share the secrets of Maravilla Gardens with you. Our intelligently designed venue was made with weddings in mind. We help busy couples who are looking for a natural space for their wedding that’s away from home, but feels like home, yet without all the work that typically comes with hosting at an outdoor venue. Spoil yourself with an artistic space your guests will rave about for years to come. Our rentals allow you to showcase your personality, giving your wedding an uncommon character. The look will leave a fresh and unexpected impression on your guests, making your wedding the one they will remember at the end of a busy wedding season. Our meticulous planning and organization means that your day will unfold smoothly. 95% of our couples rely solely on our “above and beyond” site coordinators. After all, we know our site best. Typically, we book 12 months prior to each wedding, but that varies. Our season begins the second weekend in April and ends the last weekend in October. Including site, catering, and rentals, our minimum is $14,000 for a 75-person guest count on a Friday or Sunday, with a buffet meal.The site is yours from 2:30 pm to 10:30 pm, vendors can arrive at 1:30. We provide an "above and beyond" Site Coordinator. She begins working with you 30 days before your wedding, once you know the details of the day. We offer lighting and a wonderful built-in dance floor as well. We do not provide music, flowers, photography, or the officiate. Please contact us for complete terms & conditions. We show the venue by appointment only. In that way, we are here to focus on you and your needs. Please contact us to inquire or schedule a tour. Overlooking scenic fields, Maravilla Gardens is a beautiful and peaceful natural setting for weddings and special events. Atmosphere/Decor: We are outdoors, with a pretty private garden, relaxed atmosphere, can be rustic or elegant. Special Features: Turnkey outdoor wedding venue - including lights, bride and groom rooms, site coordinating, rentals, contracted caterer.